It is my favorite time of the year--and I am back out in my yard. The first thing which has to be done is clean out all of the beds and pull all of the weeds before planting spring/summer annuals. I have been as high the the highest step of the ladder trimming limbs and as low as on my hands and knees pulling out those hated weeds. If I planted all the new annuals without pulling the weeds and preparing the beds, I would end up with weeds choking out the desired annuals in a very short time. Weeds can be very deceptive since they often have blooms--but they always end up ugly. It is a day to day struggle keeping those weeds at bay allowing the beauty of the flowers to crown a well groomed garden. My next door neighbor has a lush and thick crop of bamboo in her backyard. I don't know if you realize---you do NOT want bamboo in your yard. The bamboo will send out runners under the fence and send a shoot up in my beds. It takes constant vigilance and a love of spraying round up to keep the dreaded bamboo from getting a start in my yard. 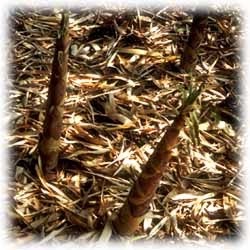 Bamboo is extremely invasive and will take over the entire yard in one season if you are not careful. I have a high fence at the back of my lot which hides the alley running behind the houses on this block. 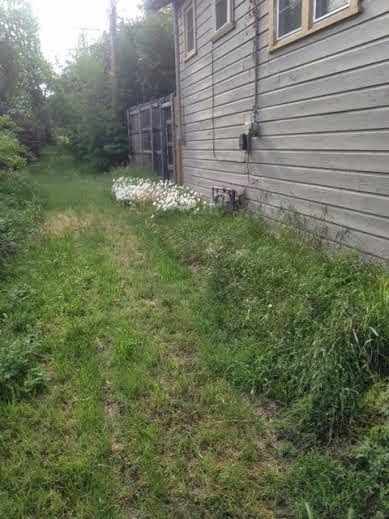 After finishing my walk recently, I happened to look down the alley and discovered a tall covering of weeds. 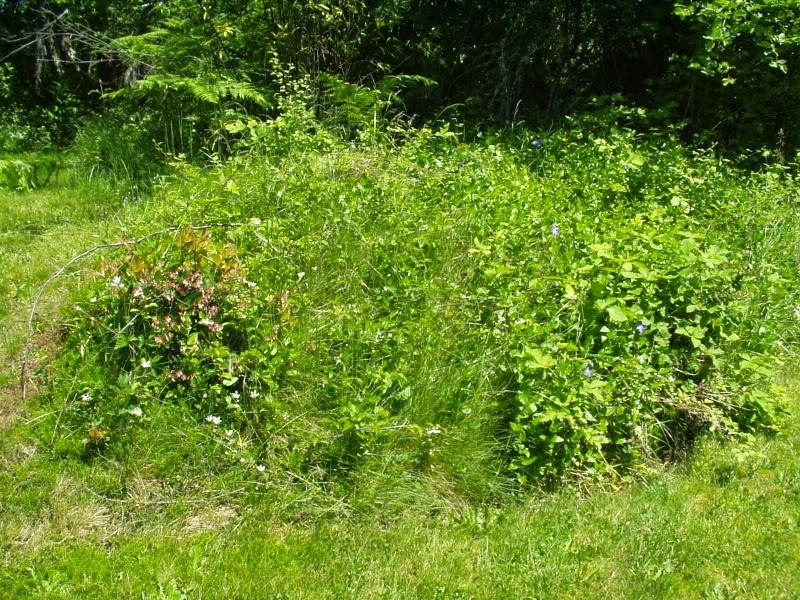 It is time to get the mower and weed eater and attack the jungle--before it also encroaches upon my yard. Long hours of tending my yard will all prove for naught, if I do not keep the weeds under control. They must be pulled up by the roots, sprayed with weed killer, or cut back into submission or the beautiful garden and lawn will begin to look like a cluttered-unkept-unloved jungle-devoid of the beautiful flowers and filled with the thick mesh of unwanted weeds. Looks like we were both knocking ourselves senseless with our landscaping! Oh my aching back ... and oh the anticipation of something beautiful to come! Such a labor of love though, Friend, for us and for Him! There is no better place than outside, and He faithfully sends the rainy days to give me a rest. Yes--we are blessed to sow in our gardens and in His, Sparky. I have missed you, Friend! Glad you are back! What a beautiful backyard. 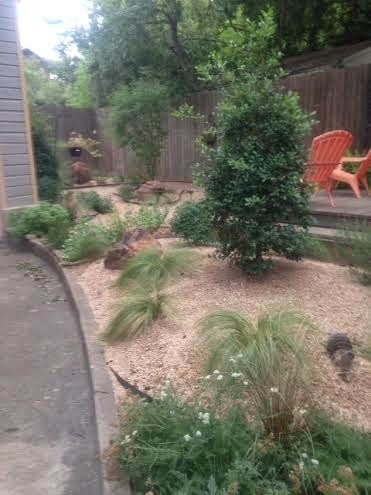 We've been spending some time in our back area getting the flower pots and raised gardens planted. It's all stamped concrete so we had to be creative. I love watching things grow. As we were in bed that night, my poor husband was trying to sleep and I couldn't stop talking. I kept saying, "I can't wait to see what God does back there to grow everything we (meaning he, ha ha) just planted." I'm always left in awe over how one day something can be so small, and the next there can be a bounty. To anyone who doesn't believe, just look around at His creations. They are daily miracles. Blessings to you, Lulu. YES, Kim! Miracles are all around---thank you for that reminder! Weeds are plants that nobody wants. They flower too and can be useful like nettle and dandelion tea. Why is it this excuse isn't accepted when I try to get out of garden duties? The other day I fought my way through the overgrown garden only to find myself standing there with a lawn-mower from the previous year !!! I waved a bunch of nettles through the open window and shouted "The Triffids have landed. The Triffids have landed". (No sense of humour some people). Oh Victor! You merely need to teach your spouse the wonders of gardening! Most of us women much prefer gardening over cleaning house. Of course you may then be saddled with the indoor duties which last 12 months of the year . Pick your poison carefully, Friend! !